Retirement income typically comes from pensions, annuities, IRAs, social security, and from investment accounts. Now, many employers are phasing out traditional pension plans that pay either a lump sum or a guaranteed monthly amount upon retirement. Instead, companies are opting to sponsor less expensive 401(k) plans. If your company has a 401(k) plan, it is wise to contribute as much as possible to take advantage of employer matching while you are employed. In addition to company matching, there is the added incentive of a tax deduction on all of the money you contribute to your 401(k). When you retire, you are able to roll the money in your 401(k) into an IRA account or annuity. Some companies allow you to do this after age 59 ½ – even if you are still employed. There are two basic types of IRA plans: Traditional IRAs and Roth IRAs, and both types are subject to annual contribution limits. Like in a 401(k), the money you contribute to a Traditional IRA is tax-deductible. Once you begin to draw income from your Traditional IRA, all of the money you withdraw is taxed as regular income. The money you contribute to a Roth IRA, is not tax-deductible. However, all of the money you withdraw from your Roth IRA in retirement comes to you tax free. It is important to note that any distributions taken from IRA plans prior to age 59 ½ are subject to an IRS penalty. This penalty does not apply to rollovers or transfers to another IRA. Successful retirement savers often take advantage of tax-deferred annuity plans funded with after-tax, or non-qualified, money. Unlike qualified plans like IRAs and 401(k) plans, there is no limit on how much you can put into non-qualified annuity plans. All of the money you put into a non-qualified annuity grows tax-deferred. Then, when you begin to draw income in retirement, you pay income taxes only on the gains you withdraw. Like in other non-qualified accounts, your principal is post-tax money and is not taxed upon withdrawal. Because the IRS gives non-qualified annuities tax-deferred status, they are considered retirement vehicles and are subject to the IRS early withdrawal penalty before age 59 ½. Like an annuity, Social Security pays monthly income for life from the Federal Government. The amount you receive is based on your previous contributions and the number of years you worked. Financial experts caution that to rely on Social Security providing all or a substantial portion of your retirement income may prove to be a disastrous mistake. Social Security is subject to congressional legislation and can therefore be eliminated or modified by congress at any time. In contrast, annuity income is contractually guaranteed by the issuing company. Companies are required to maintain adequate assets and reserves to meet all of their obligations, and they are backed by re-insurance and state level guarantee funds. Annuity plans can be structured both as non-qualified, or as qualified plans. Many people choose to rollover 401(k) plans or brokerage account IRAs into IRA annuities for retirement income. There are many different types of annuities and they vary in the degree of protection they offer and in earning potential. Annuity plans also offer a variety of income options including monthly income for life, income for a set period of time, or lump sum options. It is important to work with an Annuity Expert to help you choose the plan that will best fit your needs in retirement. 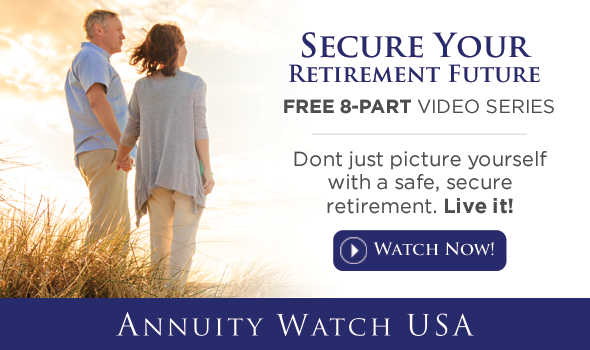 At AnnuityWatchUSA, we specialize in Fixed Index Annuities. These plans offer 100% principal protection and the opportunity to earn gains based on the performance of market indexes, such as the S&P 500. Because FIAs allow you to participate in the positive growth of the financial markets, they can provide growth that keeps up with inflation. However, when the markets perform poorly, a Fixed Index Annuity will not lose money. Retirement income can come from a variety of sources. A retirement income planning professional can help you develop a savings plan, and can also help you understand the most advantageous timing of income from your available sources. Our experts are available to discuss your options. Call (972) 473-4700 to schedule your complimentary consultation today.